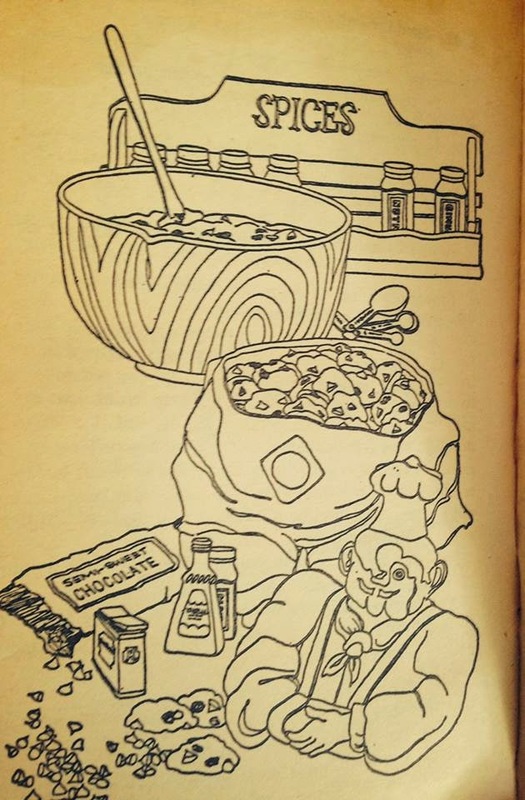 I was, at first, flummoxed at what sort of recipe would be appropriate for this project—what cookbook could I choose that would be culturally significant enough or speak to larger historical themes? I thought about it on and off for months before I realized that what matters historically to me is something that has had both great significance in my own life and also serves as a representation of another era. Turns out what I came up with is not a fancy recipe, but I knew as soon as I unearthed my father’s copy of Recipes for a Small Planet from 1973, complete with ripped pages, food stains, a torn off cover and the scent of used book stores and my childhood copy of Lord of the Rings, that my contribution had to come from this almanac of hippy values. Recipes for a Small Planet is a collection of vegetarian recipes based on Frances Moore Lappé's Diet for a Small Planet. This cookbook maintains that “a better source of protein [than meat] must be found” and seeks to provide recipes that are what they are calling “meat complementary.” In other words, these recipes show the home cook how to achieve a balance of protein with the proper combination of grains, seeds, and legumes, without using any meat products. My father was never an all-out vegetarian, but I know that he always believed in living a low-impact existence. In fact, at the time he would have first purchased this book, he had moved to a one room shack on the outskirts of Chicago where he lived between 1974 and 1984, growing his own food and wearing floral print shirts. I like to picture him making this recipe there (though I don’t know what the place looked like) just as he made the cookies in the semi-self sustaining haven of a home he and my mom created during my 90s Los Angeles upbringing. 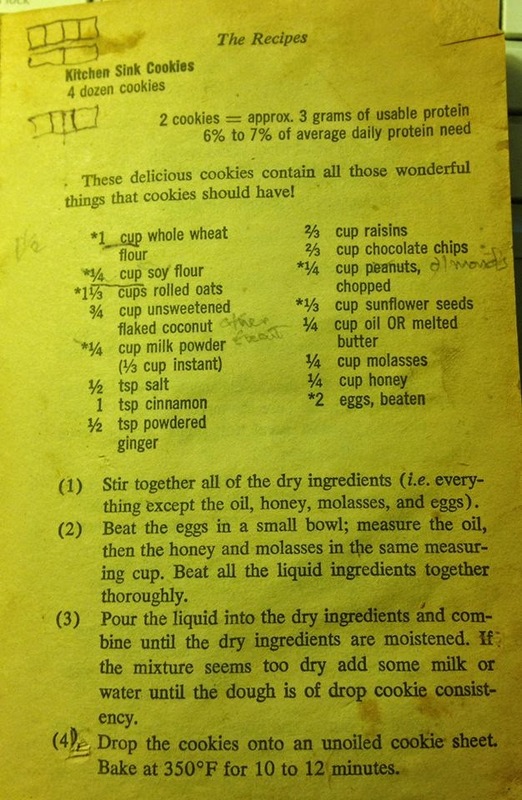 I flipped through the book several times before deciding to make the “Kitchen Sink Cookies” I grew up eating. At first I thought I wanted to try something I’d never had before. Or something really odd like a pie made from beans and rice. But then I figured that since I’d never actually made these cookies myself, and since my father has passed away and I want to be able to carry on his cookie legacy, I should probably make them. Just leafing through the book helped me gain a deeper understanding of my father’s cooking values and the simplicity of his existence during this era that he tried to bring with him when he moved to L.A. to marry my mother in the mid-80s. I kept coming across food terms that my dad used to use. Stuff like “toasted cheese sandwich” and “stove top supper.” I’d grown up assuming these were just his own weird quirks, but I’m beginning to see that they were part of the vocabulary of a subset of his generation. The recipe page itself is torn, stained and has some notes my father put in that I can’t seem to read. Almonds. I know he used almonds instead of peanuts. So I did that as well. But the other note is anyone’s guess. So chocolate, almonds, raisins, honey and molasses. Apple pie like spices and plenty of protein. These cookies pack a punch! My father used to send big boxes of them to me in college with a note that said: “share these with your friends or you will not have a happy stomach.” Great snack. But lots of fiber... And yet the chocolate makes them go down so easy. So then you have three, four, five of them. Anyway. You get my point. What matters is that they are delicious and full of good stuff. In moderation. 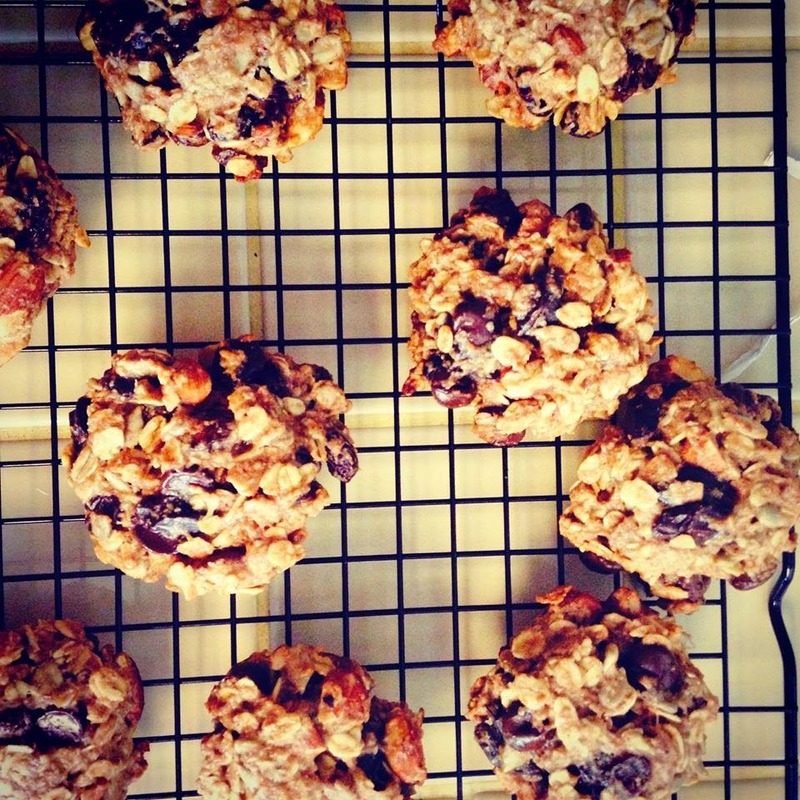 I used everything but the flaked coconut in these cookies. My dad never put that in. The note next to it must have something to do with that. So I combined all the dry ingredients. Then I mixed melted butter (I will always choose good quality butter over canola oil—both for flavor and because my personal background in nutrition has taught me to embrace butter in moderation), with the eggs, honey and molasses and combined the wet and dry ingredients. Next, I formed flattened balls using about two tablespoons of the mixture and spaced them, about 12 to a tray, on lightly oiled baking sheets. I know it specified non oiled, and there is butter in the dough, but I don’t trust my baking sheets, so I figured better safe than sorry. I actually used a spray olive oil because I didn’t want to use canola oil and it worked well. Then bake the cookies at 350 F for about 12 minutes. I rotated my sheets both 180 degrees and from bottom rack to top rack and vice versa to ensure even baking. I had a great time making these. They honestly could not be easier. They took all of 30 minutes from start to the point where I was eating them and they are so versatile! I eat them for breakfast or dessert, but I think my favorite thing to do is to take them hiking because then I can eat all the chocolate I want without feeling like I’m over-doing it. As a side note (but an important one) I definitely put at least a cup of chocolate chips in this recipe that calls for only 2/3 cup. The more chocolate the merrier. These are delicious! This was a fun trip down memory lane for me and I hope readers will enjoy making these for their friends and family. I’ve found that they’re quite a crowd pleaser, especially as an alternative to sickeningly sweet desserts. These have no refined sugar! 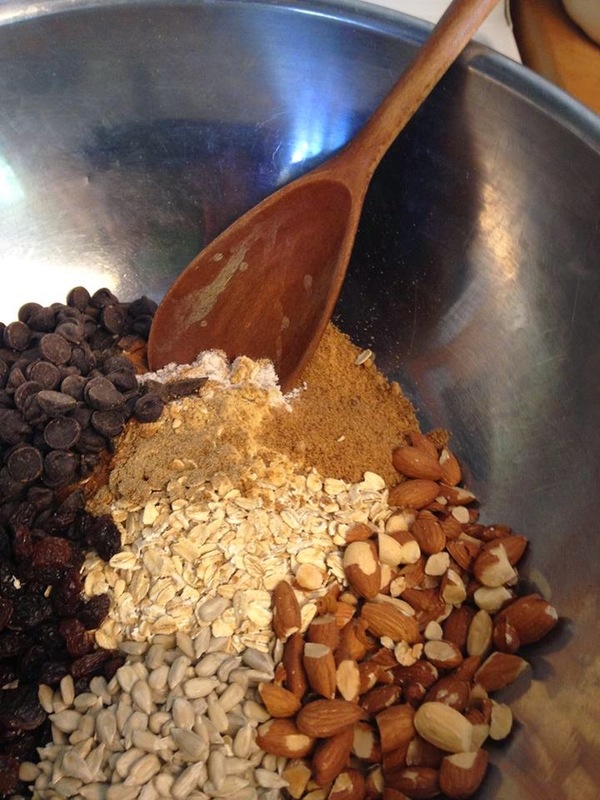 While these cookies may be from 40 years ago, they would definitely fly in today’s increasingly health conscious world where so many of us are still searching for a way to eat and live in a way that nourishes our body and the earth. Laura Derr is the founder of laurasmobilekitchen.com. Additionally, she offers private, customized, in home cooking lessons as well as menu and meal prep and small scale catering. Laura is driven to rekindle a knowledge of fresh food prepared from scratch and has a specific interest in nutrition and in working with teens and young adults, hoping to inspire a generation of advocates for health and simple living. Funny Laura, I just made these - very similar to your father's substitutions (and before reading this from you) - definitely use almonds, had no coconut so used carrots and half Apple, did not use butter, but either way OK - they are delicious!